Glendale, Lawley Village, Telford, Shropshire. WITH FABULOUS VIEWS OUT TOWARDS FIELDS AT THE FRONT: A modern detached family house with garage offering spacious accommodation. 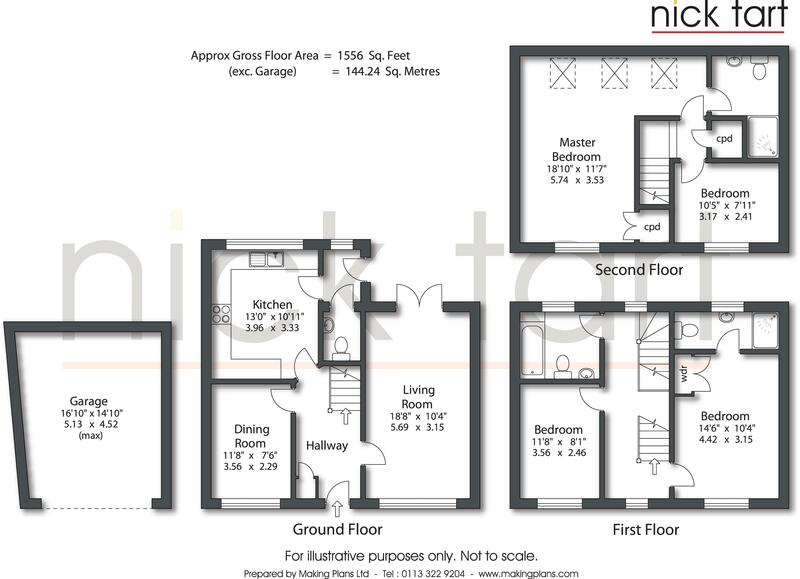 Through Hallway, 18ft Long Living Room, Dining Room, Kitchen, Rear Lobby, Downstairs WC, 4 Bedrooms, 2 En-Suites, Family Bathroom/WC, Large Garage (16'10 x 14'10" max), Parking, Landscaped Rear Garden, Energy Rating: B. The market town of Wellington, with its renowned four day a week market and leisure centre, is readily accessible a little under 2 miles to the north (again with a railway station and connection to the M54) and the World Heritage Site at historic Ironbridge is a little over 4 miles to the south. The Horsehay Golf Course is also located nearby. Comprises an entrance hallway with useful cloaks cupboard, tiled flooring, access to living room, kitchen and dining room. The living room has a dual aspect with window with outlook towards a field at the front and patio doors leading to the rear garden. The kitchen enjoys splendid views towards the rear garden and has a range of high gloss base and wall units, integrated oven and hob, space for washing machine and dishwasher, space for fridge freezer, wall mounted central heating boiler and tiled flooring which continues through to the rear lobby where there is a door leading to the downstairs cloakroom/wc and external door leading to the side patio. The dining room has an outlook towards a field at the front. On the first floor there is a galleried landing with window having an outlook towards the rear garden, access to two double bedrooms and family bathroom/wc. Both bedrooms enjoy views towards a field at the front whilst one has built-in wardrobes and the benefit of an en-suite shower room. The family bathroom/wc has a white suite comprising the usual facilities. On the second floor there is a landing with airing cupboard housing the property’s hot water system, access to the generous proportioned master suite and further bedroom. The master suite also enjoys views towards a field at the front and skyline views over north Shropshire at the rear and has built-in cupboard space and the benefit of an en-suite shower room. The second bedroom also has views towards the front. The landscaped rear garden is a credit to the current owner incorporating a number of decorative patio areas with raised borders and a lawn area with inset flowers, shrubs and trees. To the rear of the property there is a garage and parking provision. How to get there – from the Ironbridge office proceed along The Wharfage; at the mini roundabout turn right towards Coalbrookdale and continue up Jiggers Bank; at the roundabout take the 2nd exit (signposted Horsehay) onto the A5223; at the next roundabout turn left and at the following roundabout (adjacent church) turn left onto The Crescent and Smallhill Road and turn right into The Meadows and continue onto Glendale proceed to the traffic lights then turn left into Pepper Mill then left into Glendale where the property is on the left hand side indicated by a Nick Tart for sale board. Tenure – we are advised the property is Freehold. There is an estate management charge payable, the vendor has advised this is approximately £18 per month (November 2018). Services – we are advised all mains services are connected. Council Tax – Band D (Buyers should be aware that improvements carried out by the seller may affect the property’s council tax banding following a sale). A property information questionnaire is available at any time upon request.